Porcelain enamelled inside and out over sturdy cast iron. Stainless steel fittings. Smooth enamelled bases suitable for Aga and Rayburn cookers. 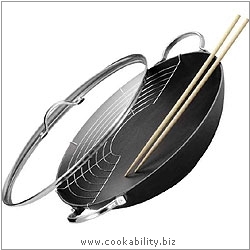 Supplied with glass lid with stainless steel rim, tempura grill and chopsticks.